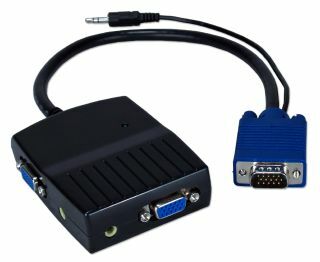 QVS is pleased to introduce MSV12MA, VGA Mini Video Distribution Amplifier that provides both stereo audio and video up to 200ft, 300MHz bandwidth, and support resolutions up to 2048x1536. This ultra-portable Mini VGA D/A is self powered either through VGA port or USB port, requiring no external power source or adaptor. Compact design allows easy installation for tight or small space. It comes with built-in 1ft cable and is small enough to carry in a laptop bag.